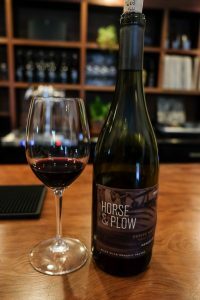 Our last stop on our Napa/Sonoma trip was Horse & Plow. 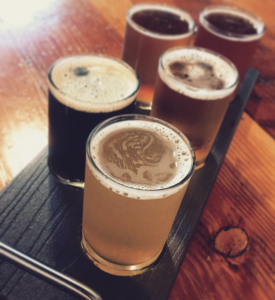 Our bartender at Sonoma Cider recommended it, and since it was mostly on the way home, we decided to make the short detour to check out one more spot and prolong Sunday Funday. 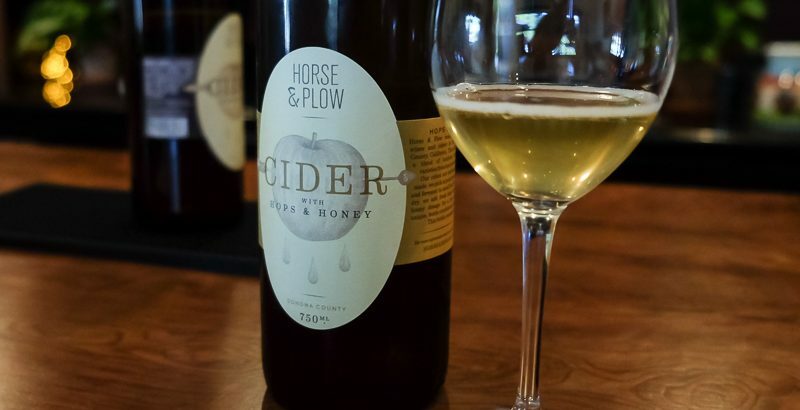 Horse & Plow makes both cider and wine. I don’t know a ton about wine, but the fella works in the industry, so he’s always happy to try something new. I was really excited about the true farmhouse-style cider. Plus, the name reminded us of “Horse & Hound,” our favourite magazine that Hugh Grant pretended to work for in a rom-com. It’s a small tasting room, but they are fine with drop-ins, at least on the weekends. I loved the decor of the indoor tasting room; a little old fashioned and stylish, but comfortable. It had kind of this record store-meets-cozy barn-meets-comfy lounge kind of vibe. There’s also an outdoor area with a fire pit. We sat inside at the bar, and the staff at the bar was efficient, but friendly enough when they got a free moment or two. They charge for tastings, but I believe they refunded the price of the tasting with a two-bottle purchase. We ended up really liking what we tried, so we ended up buying both cider and wine. 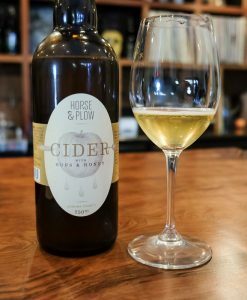 Farmhouse: We started with this one, and right away, I loved that apples were the centerpiece of this cider. I mean, it should go without saying, but it’s not always the case. The staff told us that they fermented a whole bunch of local apple varieties separately, then created the perfect blend out of 12 varietals. Me: 4.25 originally, but I upgraded to 4.5 after we took the bottle home—I felt like it opened up and kept getting better, fella: 4.5 both times. Heirloom: Made with all heirloom varietals, this was also apple-forward and very fresh. Its process is similar to the Farmhouse. I found it more effervescent and just as delicious. Fella noticed that it was drier than the Farmhouse. Me: 4.25, fella: 4. Oz Farm: The cider was made from apples all from the same farm (Oz Farm!) in north Mendocino County. It was noticeably more tart than the first two, and still delicious. Me: 4, fella: 4.25. Hops & Honey: A 10-varietal blend that is dry-hopped, with honey and yeast added during the bottling process. It was unique. Not too hoppy, but still more hops than I generally want in my cider. Fella enjoyed the hops more than me (quite predictably) and said that it reminded him of Golden Delicious apples. Me: 3.5, fella: 4.25. The wine was also enjoyable. Everything they make is organic and sourced from growers that they trust. They are committed to a natural, vegan, non-GMO process, and the wines contain either low or no sulfites. I didn’t take notes, but we brought home both the Petite Sirah and the Pinot Noir, in addition to 3 bottles of cider: Farmhouse, Heirloom, and regular Cider, which they did not have available for the tasting, and we have not popped our bottle yet. We’re actually sipping the Pinot Noir now; it’s a little spicy and a nice red for a cool evening. Well, cool for California standards, anyway. Disclaimer: The fella works in the alcohol business, and Horse & Plow gave us an industry discount on the bottles.